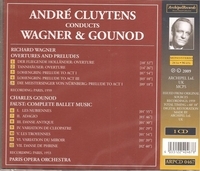 “André Cluytens was among the leading French conductors of his time. His father, Alphonse, was conductor at the Royal French Theater of Antwerp. André became his assistant and a choirmaster there. When an illness prevented Alphonse from conducting, André made his performance début in 1927. After that experience he devoted his efforts to orchestral and opera conducting rather than choral work, and he became a resident conductor in the house.